The Global Volcanism Program has no activity reports for Recheschnoi. The Global Volcanism Program has no Weekly Reports available for Recheschnoi. The Global Volcanism Program has no Bulletin Reports available for Recheschnoi. 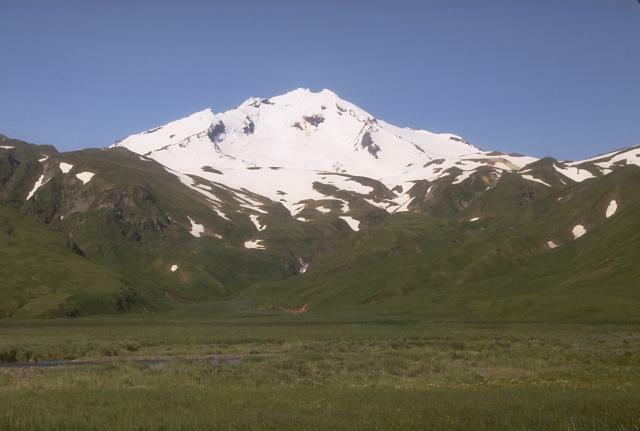 The heavily glaciated, 1984-m-high Recheschnoi stratovolcano is located ENE of a roughly 900-m-high saddle across from Vsevidof volcano. Recheschnoi consists of an elongated, NE-SW-trending ridge that is dissected by deep glacier-filled valleys. Erosion is more extensive at the NE end. Holocene andesitic pyroclastic cones and rhyolitic lava domes, the latter west of the head of Russian Bay, are situated on the east and west flanks of the volcano. The Geyser Bight geothermal area on the NE flank of Recheschnoi is one of the hottest and most extensive thermal areas in Alaska. It consists of six zones of thermal springs and two fumarolic areas along upper Geyser Creek and contains the only known geysers in the state. Other thermal areas occur at Hot Springs Cove and Partov Cove on the rugged isthmus between Recheschnoi and Okmok volcanoes. This volcano is located within the Aleutian Islands, a UNESCO Biosphere Reserve property. Byers F M, 1959. Geology of Umnak and Bogoslof Islands, Aleutian Islands, Alaska. U S Geol Surv Bull, 1028-L: 267-365. Byers F M, 1961. 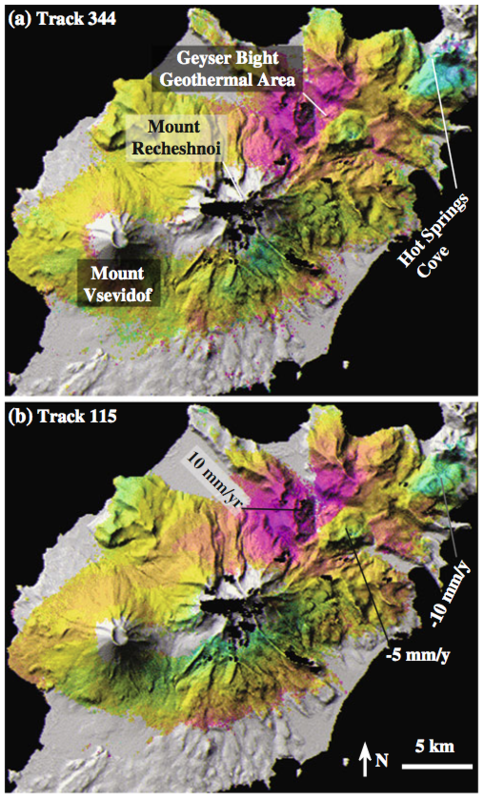 Petrology of three volcanic suites, Umnak and Bogoslof Islands, Aleutian Island, Alaska. Geol Soc Amer Bull, 72: 93-128. Myers J D, 1994. The Geology, Geochemistry and Petrology of the recent Magmatic Phase of the Central and Western Aleutian Arc. Unpublished manuscript, unpaginated. The Global Volcanism Program is not aware of any Holocene eruptions from Recheschnoi. If this volcano has had large eruptions (VEI >= 4) prior to 10,000 years ago, information might be found on the Recheschnoi page in the LaMEVE (Large Magnitude Explosive Volcanic Eruptions) database, a part of the Volcano Global Risk Identification and Analysis Project (VOGRIPA). There is data available for 3 deformation periods. Expand each entry for additional details. Remarks: Uplift near Geyser Bight and Hot Springs Cove due to magma intrusion and/or hydorthermal pressurization. Remarks: Localized subsidence superimposed on a broad inflation signal, centered SE of Geyser Bight. Probably due to depressurization or degassing of the hydrothermal system. Remarks: Subsidence near Hot Springs Cove, probably due to depressurization or degassing of the hydrothermal system. There is no Emissions History data available for Recheschnoi. Russian Bay valley is located on the NE flank of the heavily eroded Recheschnoi volcano. Glacial dissection is most pronounced on the NE side. However, this side of the volcano also contains some Holocene rhyolitic lava domes and a large thermal area that includes a geyser. Photo by Chris Nye (Alaska Division of Geological & Geophysical Surveys). Mount Recheschnoi is a 1984-m stratovolcano on Umnak Island that has been extensively dissected by glaciers. This 1985 view from the SW shows the elongated NE-SW-trending summit ridge, which is dissected by deep valleys. Although no historical eruptions are known, Holocene pyroclastic cones and lava domes occur on the east and west flanks, and a large thermal area including hot springs and a geyser is found on the NE flank. The effects of erosion are visible in this view from the SW of two prominent stratovolcanoes on SW Umnak Island in the Aleutians. 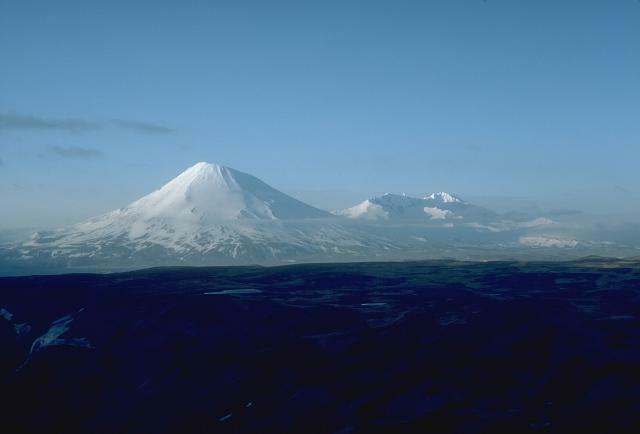 Mount Vsevidof (left) is a symmetrical, constructional volcano where frequent eruptions, which have continued into historical time, have overcome the effects of erosion. 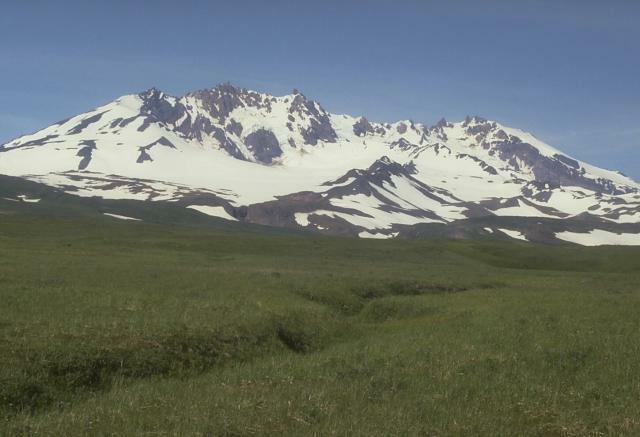 Recheschnoi volcano (right), in contrast, has been inactive for longer periods of time and has been extensively dissected by glaciers. Only small pyroclastic cones and lava domes have erupted during the past 10,000 years. Photo by Chris Nye, 1985 (Alaska Division of Geological & Geophysical Surveys). There are no samples for Recheschnoi in the Smithsonian's NMNH Department of Mineral Sciences Rock and Ore collection. Large Eruptions of Recheschnoi Information about large Quaternary eruptions (VEI >= 4) is cataloged in the Large Magnitude Explosive Volcanic Eruptions (LaMEVE) database of the Volcano Global Risk Identification and Analysis Project (VOGRIPA).